It is that month of the year, when people start looking for a job change. Once appraisals are done in the month of march, people would step up the job hunting phase. The Tamil Nadu CM, Mr. OPS finally submitted his resignation to the Governor of Tamil Nadu. 1) He opens the letter without any greeting. This shows he does not want to beat around the bush. 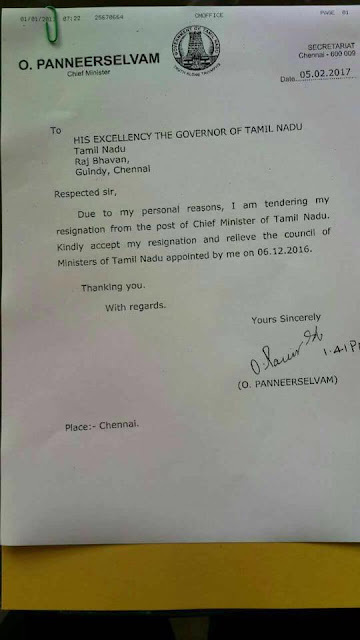 In Vadivelu's words, OPS has written this letter with the "Naan suthi valachu pesa varala" tone. 2) He says that he is tendering his resignation because of personal reasons. It means that it is not a reason associated with his party members. He is going through some personal problem at home. May be he needs family counselling. All family counselors can contact him and find a remedy for him. 4) In corporate set up, there is a two months notice period for employees. But OPS has asked to be relieved with immediate effect. Is buy-out the reason behind this? But who would have bought him out? 5) Finally in his signature, he has written " O Power Star". Where did Power Star come from? 858. Will you forgive this girl?